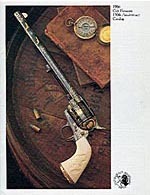 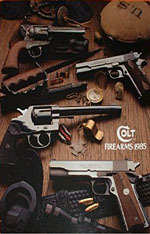 The new Colt "Python Hunter" .357 magnum revolver, the Colt Heritage Black Powder "cap & ball" revolvers (the Colt Walker .44, the 1860 Army .44, the Colt Dragoon .44, the 1851 Navy .36, the 1862 Pocket Navy .36, & the 1862 Pocket Police .36), the famous Colt Single Action Army revolver (the Peacemaker), the Colt SAA New Frontier revolver, the Colt Ace .22 automatic, the Colt Gold Cup National Match .45 automatic, the Colt Government Model .45 automatic, the Colt Commander and Lightweight Commander automatics, the Colt Detective Special .38 Special revolver, the Colt Diamondback .38 Special revolver, the Colt Lawman Mark III .357 magnum revolver, the Colt Trooper Mark III .357 magnum, the Colt Python .357 magnum revolver, the Colt Target Python revolver (8 inch barrel) in .357 magnum, .38 Special, and the new .22LR & .22WMR. 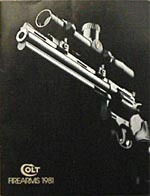 - the AR-15 4x scope. 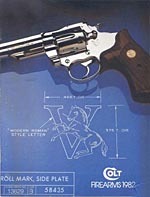 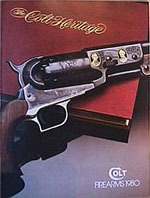 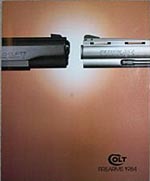 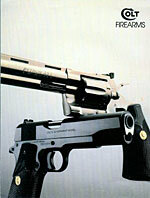 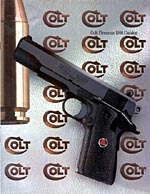 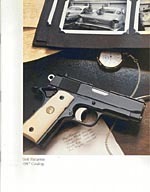 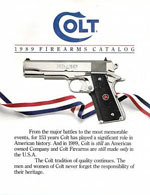 Colt Catalog supplement: "The Colt Collection" accessories.